Last night’s Academy award red carpet was ruled by white and black gowns, as plain-jane glamour ruled the red carpet. This year 54 years-old Julianne Moore walked away with best actress award; unfortunately her gown didn’t make to our list. Patricia Arquette in Rosetta Getty took home the Best Supporting Actress. But it was Emma Stone & Lupita Nyong’O who rocked the red carpet. In a Sea of black and white gowns, Emma Stone‘s chartreuse green full-sleeved Elie Saab number was a breath of fresh air; she completed her look with matching sandals and side-swept hair. She was perfection. Wearing a custom-made Calvin Kelin gown, last year’s best supporting actress winner Lupita Nyong’O shut down the Oscars Red Carpet in style; the gown featured a plungy neckline with intricately placed key-hole. The gown was embellished with whooping 6,000 pearls! Wearing a lipstick red high-slit Givenchy custom-made gown, Rosamund Pike looked absolutely stunning . Jennifer Lopez‘s love for Lebanese designer is quite obvious and we understand why she loves him. Wearing a Elie Saab ball gown from his last year’s haute-couture week collection, she finished her look with Salvatore Ferragamo clutch. She looked amazing. Wearing a J. Mendel gown from his latest creation, Faith Hill wowed everyone with her ivory-white column gown, which featured a plunging neckline. 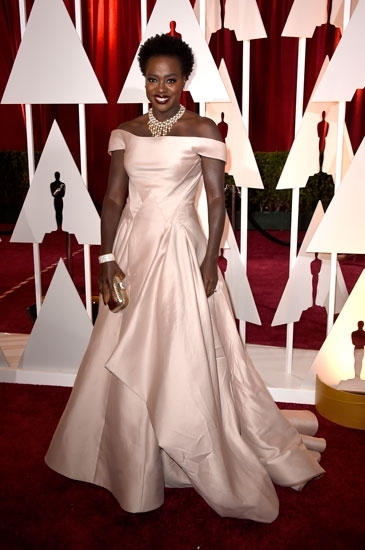 Viola Davis could have been in the best dressed list with her stunning ball gown by Zac Posen, but her neck piece and clutch were bit over the top and didn’t go well with the gown. Cate Blanchett: Last year’s best actress winner Cate Blanchett wore a Maison Margiela Couture gown; this simple black gown was the perfect choice for Cate and the necklace added right amount of colour to make the whole look stand out. Margot Robbie: After last year’s disastrous Gothic look, Margot Robbie finally made a stunning come-back to the Oscars in a Saint Laurent gown; it was simple and classy. Nancy O’Dell: Looked like a true Hollywood diva in Designer Gauri & Nainika’s creation; the black gown was a winning piece. Meryl Streep: Wearing a white and black Lanvin gown with a jacket, Meryl Streep channelized her inner Miranda Priestly; she could have ditched the earrings, but she managed to look good. Patricia Arquette: The Best Actress in Supporting Role winner might have taken in Rosetta Getty column gown, which looked like it was from Meryl Streep’s closet. Octavia Spencer : Academy Award winner Octavia Spencer wore her favourite designer Tadashi Shoji & once again proved that you can be a true fashionista no matter what shape and size you are. 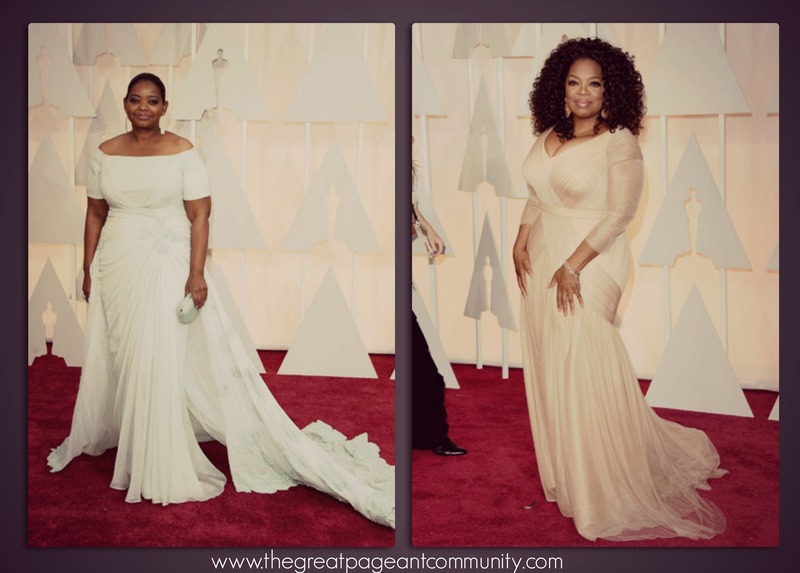 Oprah Winfery: Ducted the Security line at the red carpet; we know she was excited to show her beautiful beige gown.